What Is a Decentralized App (dApp)? Decentralized app and blockchain technology is going to change the way humans interact with web applications. Perhaps, you have already heard about the line “Future is Decentralized.” Yes, you have heard correctly. Decentralized applications (dapps) are evolving rapidly. New projects are entering the market based on blockchain technology and they are totally decentralized applications. 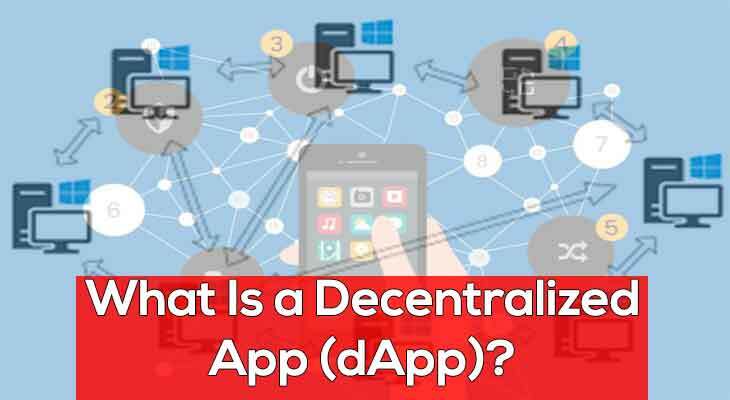 The article will discuss what is What Is a Decentralized App (dApp) along dApp examples. Decentralized applications (dApps) are applications that are based on blockchain technology. dApps run on a P2P network of different computers rather than a single computer. dApps have been since the beginning of P2P networks. It is actually a type of software program designed to run on the Internet in a way that is not controlled by any single entity. All the data on the decentralized app is stored on the distributed ledger. It is impossible to hack the decentralized network. As the crypto market is giving the trust, the dApps are also revolving around the internet. New dApp projects are making their way to the market. Crypto market is no more limited to just currency. The new coming decentralized applications are providing the solutions to real-world problems. We will not discuss Bitcoin and Etherium as dApp examples as everybody knows about them. Rather we will discuss the new decentralized projects that are providing the solutions to the real world problems. There are hundreds of decentralized applications are available on the internet and they are working on the base of the peer to peer network. The crypto industry is new and it evolving with time. That’s the reason many people don’t have any idea about these amazing projects. We will discuss some of them but you can visit coinmarketcap and check all the 1650 decentralized applications available there. Vevue is an amazing project that is based on the decentralized system. Hence we can say it is a Dapp. It promises to “bring Google Street View to life”, by enabling users to take 30-second video clips of restaurants, hotels, places, events and more to share with other people around the world. All users need is a smartphone, and by answering requests pinned in their neighborhood they can earn bitcoin or even Vevue equity tokens in selected areas. The “Make Videos, earn Bitcoin” app is already available on the Google Play store, though is not in its final state and does not currently reward users. 4G Capital provides instant access to credit for small business growth in Africa and has developed a concept dapp for the use of smart contracts. Donors would be able to use the dapp to fund small businesses in Kenya using digital currency. The money lent would be converted and disbursed to the businesses using 4G Capital’s transactional system. Its vision is to empower individuals, businesses, and markets by delivering financial inclusion and supporting change across Africa from the grass root level. Eth-Tweet is a decentralized social network which provides the facility to tweet the message of up to 160. It is a decentralized microblogging service running on the Ethereum blockchain. No central entity controls what is being published, and once a message is posted, no one can remove it except the publisher. Swarm City is a decentralized P2P sharing economy. Some call it the decentralized Uber or Craigslist. Swarm City is also a blockchain based project. The aim is to build a “platform that lets people find each other, communicate, and exchange value in a decentralized way”. People will be capable of building the marketplaces, and they will also be able to form communities of like-minded individuals. For example, users will be able to create their own buy/sell marketplace like Amazon, and communities of retailers will form to deliver products in that marketplace. And drivers will band together as communities to provide services in rideshare marketplaces. FirstBlood is bringing Decentralized blockchain technology to the growing & thrilling market of Esports. We know millions of gamers around the world love to have a chance to be a pro gamer and truly make a living from ‘playing’ not ‘blogging’. It’s like Pokerstars for highly skilled players to monetize their time or just plain gamble gamers. The Export industry is predicted by many to see rapid growth over the next few years and beyond. Bitshares is actually the original Decentralized Exchange built on a blockchain and operates as a true DAO providing decentralized Blockchain banking & financial services. It provides the service of a trading platform that can do the volume of the NASDAQ but in a truly decentralized P2P manner. If cryptocurrencies continue to see centralized exchange hacks and old guard defensive regulatory attacks, which is almost certain, the growth of Decentralized Exchanges (DEXs) seems similarly likely. Cybercrimes are increasing day by day in this modern era of technology. We need a powerful mechanisms to secure people’s identity. Different companies are entering the market with the aim of providing security to the different platforms available on the internet. KYC-chain is a decentralized system. KYC-Chain promises to provide that kind of security at the highest level. They use the existing KYC (Know Your Customer) Model and simplify the process of identification of new customers for businesses. Have you ever heard about Fiver, Upwork, Freelancer and some other freelancing platforms? You can work online at your home by using these platform. Now, the blockchain version of these platforms is here and it’s EthLance. It is an Ethereum based freelancer platform where potential employers can post freelance job offerings and freelancers can apply for jobs. Freelancers get paid in form of Ether tokens and smart contracts. are used to make automated payments once the job is done. The company aims to install machines that will help in cryptocurrency transactions. Digitalizing any physical stores. Buy cryptocurrency using fiat, bank card, mobile wallet or Pundi XPASS.